I’m not a dog guy. Never have been. We had a couple small dogs when I was a kid, but I haven’t been around dogs for twenty years or so. Allergies. Plus all the mess and hassle. They shed, they chew up the furniture, they need shots. You’ve got to walk them, feed them, pick up their poop with a plastic grocery bag. What could be more degrading? 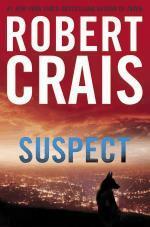 But Suspect by Robert Crais makes me want to run down to the Humane Society and get a dog immediately. A big dog. A German Shepherd. I won’t of course. My sinuses would cinch up tight, and my eyes would get puffy. But man, it might be worth it if my dog were as loyal and loving and full of soul as is Maggie, the co-protagonist in this excellent crime thriller. Maggie was a bomb-sniffing dog working with the Marines in Afghanistan before she was wounded and lost her handler. When she partners with a K9 police officer also suffering from his own tragic past, the true pack and partnership of the novel begins. And oh what a novel it is. This is Crais at his best. A crime thriller that sinks its teeth in you and won’t let go, just as Maggie is trained to do. Like all Crais novels, it starts with a bang and then settles into a slow gradual boil as the mystery unravels and the truth comes to light. Honestly, this one is right up there with the best Elvis Cole and Joe Pike novels, which I didn’t think possible. I hope we see Maggie and Officer Scott James is many more thrillers to come. I guarantee you I’ll be there, leash in hand, ready to hook and go along for the ride.